The official Australian Skyward Sword website has launched and it features the same goodies that we saw at the Nintendo of America site. However, the one noteworthy edition on the Australian website is the release date! 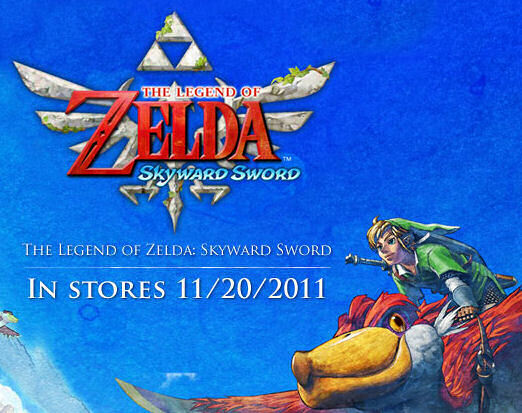 The site shows an upcoming release of November 20th, 2011, the same exact day that Skyward Sword hits shelves here in America! This is great news as Australian Zelda fans feared the worse after a near two-week delay in release for Ocarina of Time 3D. With Europe getting Skyward Sword on November 18th, America getting it on the 20th, and Japan getting the game on the 23rd, we all expected a late November or early December release date in Australia. It’s nice to know our friends down-under will be able to experience Skyward Sword at the same time as most of the world. NOTE: The release date is in the American style, (month, day, year), as opposed to the Australian style, (day, month, year), so perhaps this could be a mistake. The background image is nearly the same as the Nintendo of America website, so there is a chance they just used that same image for the placeholder. It’s hard to believe they would make such a mistake, but it is also head-scratching that they would put the release date in the American format. Stay tuned for the latest on the release date. In addition to the release date, the Australian website has one of the trailers available, six screenshots within their gallery, links to pre-order the game, as well as a link to the Zelda 25th Anniversary Minisite. Source: Nintendo of Australia. Thanks The Minish for the News Tip!